Article I, Section 8, clause 17, of the newly ratified Constitution gave Congress the power to create a seat of government for the United States. Subsequently, in a letter dated September 11, 1789, Pierre Charles L'Enfant wrote to President George Washington requesting that his services be employed in the planning of the Nation's capital. On January 24, 1791, Washington chose the location for the new capital, and assigned Andrew Ellicott to survey the ten-mile square district. Ellicott was notably aided by Benjamin Banneker, a self-taught astronomer and one of the few free blacks in the area. Banneker's calculations established the boundaries of the District. President Washington commissioned L'Enfant to plan the city. Pierre Charles L'Enfant, an engineer, artist and soldier that served under the direction of George Washington, designed the Plan for the Federal City. The L'Enfant Plan was submitted to Congress in December 1791. 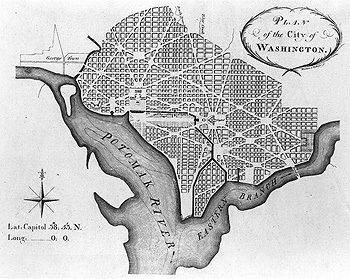 Pierre Charles L'Enfant's Plan of the City of Washington. Having determined some principal points to which I wished to make others subordinate, I made the distribution regular with every street at right angles, North and South, east and west, and afterwards opened some in different directions, as avenues to and from every principal place, wishing thereby not merely to contract with the general regularity, nor to afford a greater variety of seats with pleasant prospects, which will be obtained from the advantageous ground over which these avenues are chiefly directed, but principally to connect each part of the city, if I may so express it, by making the real distance less from place to place, by giving to them a reciprocity of sight and by making them thus seemingly connected, promote a rapid settlement over the whole extent . . .
A principle concern of L'Enfant was to connect the city both physically and spatially. Avenues were to promote easy access to widespread parts of the city, and a "reciprocity of sight" was to make the chief reservations and federal structures easily discernible, thereby linking together the various communities. The situation of these Squares is such that they are the most advantageously and reciprocally seen from each other and as equally distributed over the whole City district, and connected by spacious avenues round the grand Federal Improvements . . . The Settlements round these Squares must soon become connected. L'Enfant described Pennsylvania Avenue as "a direct and large avenue from the bridge on the Potomac to that on the Eastern branch . . . with a middle way paved for heavy carriage and walks on each side planted with double Rows of trees." 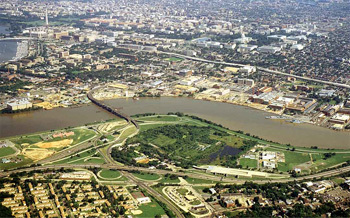 The Manuscript Map shows what L'Enfant had in mind; a bridge to the west would connect the district with Georgetown while a bridge to the east would cross the Eastern Branch of the Potomac (now the Anacostia) toward Maryland. Coming up from Maryland, the Avenue would intersect with the Legislative and the Executive branches, and pass by several important federal buildings. Off that same avenue, L'Enfant planned a Judicial building opening onto the Mall between 4th Street and 5th Street and a National Church on the 8th Street axis. The Mall extending westward from the Capitol would intersect with the lawn extending southward from the White House. Both the Capitol and the White House were to have expansive views up and down the Potomac, symbols of Federal power surveying the land over which the Legislature and Executive govern. Though the structures along Pennsylvania Avenue are of utmost importance, chief to L'Enfant's vision was the idea of public space; hence L'Enfant allocated 68 percent of the original city to avenues, streets, squares, circles, and public reservations. While prominent Federal buildings would display the power and importance of government, ample public space would underline the democratic ideals upon which the Nation was formed. After L'Enfant razed a house being constructed for a prominent landowner because it stood in the proposed New Jersey Avenue, Washington wrote to L'Enfant, "In future I must strictly enjoin you to touch no man's property without his consent, or the previous order of the Commissioners . . . Having the beauty, and harmony of your Plan only in view, you pursue it as if every person, and thing was obliged to yield to it." It was L'Enfant's unyielding and unbridled passion for his plan that led to his dismissal in February 1792. Two hundred and five years later, on April 24, 1997, the L'Enfant Plan was nominated to the National Register of Historic Places. During the ensuing years, L'Enfant's vision for the capital of an emerging Nation has been changed for varying reasons. However, chief among those reasons were economic development and transportation needs. Those changes weren't always compatible with L'Enfant's Plan, but today in an appreciation of the genius of L'Enfant's vision, Federal and city planners are attempting to undo some of the past transgressions that have obscured portions of that initial vision. The city is seeking to reconnect some of the L'Enfant Plan streets that have been blocked in the name of economic development, reestablish vistas blocked or interrupted by transportation facilities, and convert major arterials and portions of the Interstate System to the grand boulevards and avenues originally laid out in the plan for the Federal City commissioned by the first President of the United States. This is especially true in the southeastern quadrant of the city where South Capitol Street, a major L'Enfant Plan street with vistas of the Capitol, is being converted from a highway into a grand boulevard and to the 11th Street Bridges infrastructure that is peripheral to that corridor. Dubbed AWI, the Anacostia Waterfront Initiative is an extremely ambitious planning study developed by the District of Columbia Office of Planning (DCOP) intended to transform the entire southeastern sector of Washington, DC, with special emphasis placed on the development and revitalization of the Anacostia riverfront. Existing Anacostia Waterfront with a view toward the Washington Monument. The DCPO's vision of the AWI is of a clean and vibrant waterfront with parks, recreation uses, and urban waterfront settings-places for people to meet, relax, encounter nature, and experience the heritage of the waterfront neighborhoods. The AWI also seeks to ensure that the social and economic benefits derived from a revitalized waterfront are shared by those neighborhoods and people living along the Anacostia River for whom the river has been distant and out of reach. Artist rendering of showing the AWI vision. 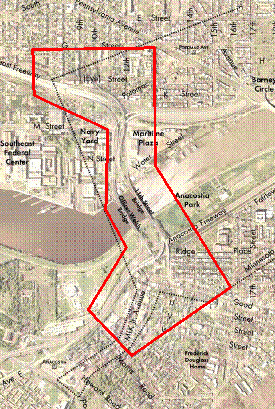 The Waterfront MOU Boundary Map. The first sentence of the Preamble to the MOU states that "The Parties . . . will help to attain a vision for the waterfront areas. This partnership will build on the great historic plans for the District of Columbia . . ." a very applicable nod to the vision expressed in the L'Enfant Plan. As a result of the visionary influence of the AWI, a number of subsequent Transportation Studies were spawned. The AWI gave birth to a number of transportation studies. One of those studies was The Middle Anacostia River Crossings Transportation Study or MAC Study. 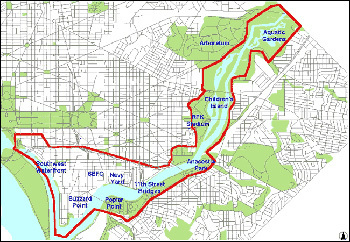 The MAC study evaluated current and future transportation needs in the southeast and southwest sector of the city adjacent to the river shown on L'Enfant's plan as the Eastern Branch, now known as the Anacostia River. 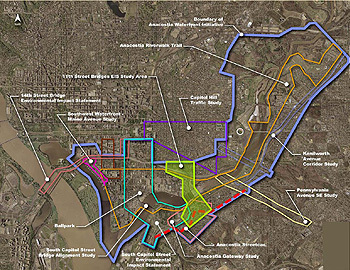 A revitalized transportation corridor across and adjacent to the Anacostia River was an important first step in a commercial rebirth of that quadrant of the city. Like many cities with undeveloped riverfronts, the District of Columbia recognized this unpolished jewel in its midst and seized upon the opportunity to improved transportation infrastructure which was the key to its development. One of the leading recommendations of the MAC Study was the replacement of a major bridge structure that crossed the Anacostia River, the 11th Street Bridges and the reconfiguration of the interchange east of the river. This would provide for full directional access to the Anacostia Freeway and a more balanced transportation system by adding the missing movements to the major interchanges. Flush with anticipation and eager to jumpstart a key transportation component in the realization of the promise of the AWI, the District of Columbia City Council earmarked $250 million in local funding to begin preliminary planning and subsequent design and construction for the 11th Street Bridges project; however, to add a further incentive for a quick start, the DC City Council required that upon acceptance of the funds, the construction should begin within a two year window of time. Realizing it had to expedite the National Environmental Policy Act (NEPA) process in order to meet stipulations attached to the local funding, the District of Columbia Department of Transportation (DDOT) applied for Priority Project status to streamline the NEPA process. At the time of the DDOT application, the Division Office felt it did not meet the criteria for Priority Project status; however, since the U.S. Department of Transportation was a signatory to the AWI MOU, Administrator Mary Peters, in consultation with the DC Division Administrator and key Division staff, decided to provide DDOT with a special liaison from the Office of the Secretary and commit the newly formed Headquarters' NEPA Team to assist during development of the NEPA Process. This triggered the early involvement of the Eastern Legal Services Team as well. FHWA Headquarters in the Southeast Federal Center is located just outside of the study area. DDOT procured a consultant-CH2M Hill-with a deliverable date of twelve months to complete the environmental process required by NEPA, ending in a Record of Decision (ROD). Considering the complexity of the undertaking and the coordination required, the deliverable date proved to be unrealistic. 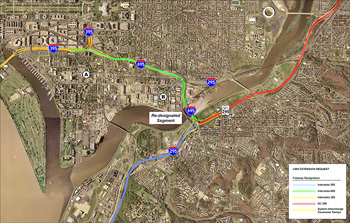 Following the recommendation of the MAC Study, DDOT proposed a project to reconstruct and reconfigure the interchange of the Southeast/Southwest Freeway and the Anacostia Freeway over the Anacostia River in Southeast Washington, DC, a distance of approximately one mile. 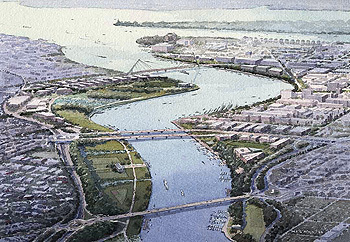 Prominent elements of the project design would include new ramps located east of the Anacostia River that would connect from both directions. Proposed reconstruction and reconfiguration of the Southeast/Southwest Freeway and the Anacostia Freeway interchange. This project would reduce congestion, improve mobility, enhance safety for all modes, replace functionally obsolete and structurally deficient infrastructure and provide for an alternative evacuation route. The new bridge structures in the selected alternative would accommodate both local traffic and freeway traffic on a newly re-designated segment of the Interstate that would be numbered as I-695 from a de-designated portion of the Interstate that was numbered I-295. The local structure would carry four lanes with provisions for pedestrians and bicyclists; but two of the four traffic lanes will be designed for a streetcar facility as part of a future project under consideration. 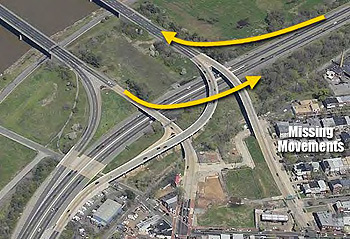 The freeway structure would carry eight lanes of traffic, four in each direction. Build Alternative I would depress the Anacostia Freeway in a tunnel approximately 230 feet long and 10 feet below the water level of the Anacostia River. 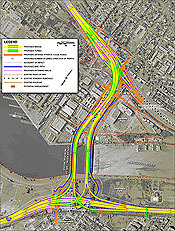 The depression of the Freeway would lower the overall height of the Anacostia Freeway interchange complex by approximately 30 feet relative to the other build alternatives. Build Alternatives I, II, III, and the Preferred Alternative would provide a reconstructed eight-lane freeway bridge along the alignment of the existing 11th Street Bridge as well as a local four-lane bridge crossing on the current alignment. Both of these structures would accommodate two-way traffic on each structure. Pedestrian and bike facilities would be adjacent to the local travel lanes. In Build Alternatives III and IV, the continuity of traffic from the Southeast/Southwest Freeway to Southeast Freeway Boulevard would be maintained and traffic would continue free-flow via a provided underpass. Interchanging traffic to/from 11th Street from either facility would be served via at-grade intersections at 11th Street. Build Alternative IV would have a barrier that separates local and freeway traffic on eight freeway lanes and four local lanes. Both of these structures accommodate one-way traffic on each structure. Pedestrian and bicycle facilities would be adjacent to the local travel lanes. 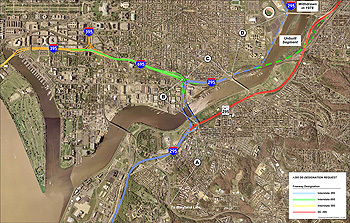 Build Alternative IV requires that 11th Street (eastbound) and 12th Street (westbound) operate as one-way roadways between approximately K Street and the Anacostia River. In the Preferred Alternative, the Southeast/Southwest Freeway, Southeast Freeway Boulevard and 11th Street would connect through at-grade intersections on the local street grid. Continuity of traffic from the Southeast/Southwest Freeway is eliminated and traffic going from the Southeast/Southwest Freeway to the Southeast Freeway Boulevard must go through a traffic signal. The Preferred Alternative which became the Selected Alternative was a hybrid resulting from public and stakeholder input. It is a rare occurrence when portions of the Interstate system are de-designated from Interstate and reconverted to the city grid street system. Another step in recapturing the L'Enfant vision in the southwestern quadrant of the city is the de-designation of a portion of I-295 to a boulevard and park like green space. The existing Interstate System in Washington, DC. The portion of I-295 shown by the arrows emanating from "C" will become a grand boulevard with shops and businesses in a related but separate transportation action from the 11th Street Bridges project. This is another example of how transportation can forge the way for future development opportunities, in addition to creating opportunities for additional green space reminiscent of the parks and reservations that were so prominent and pivotal to L'Enfant's vision for the Federal City. The proposed changes to the Interstate system will require that I-295 across the 11th Street Bridges will be de-designated from I-295 and re-designated as I-695, essentially allowing the bridges to function as ramps from I-295 to I-695 in the District of Columbia. DC-295 will continue to the east and connect with Maryland Route 295 known as the Baltimore-Washington Parkway. Eliminating the I-295 designation from across the 11th Street Bridges and removing that portion of I-295 east to Pennsylvania Avenue will eliminate a great deal of confusion for motorist and law enforcement authorities related to that portion of the Interstate. The de-designation/re-designation request for I-295 and I-695, which includes an Interstate Modification/Justification Request, will be reviewed by the DC Division Office before being sent to FHWA Headquarters for approval. The proposed re-designation Interstate System in Washington, DC. On July 2, 2008, the first Record of Decision (ROD) ever written for a Federal undertaking in Washington, DC, was signed by FHWA. It was a seminal moment and a significant first step with a transportation project taking the lead in opening the door of possibilities for the first step in the realization of a modern day visionary plan that follows in the legacy of the L'Enfant vision for the Nation's Capital. It is remarkable, and a testament to the built out environment in the District of Columbia, to consider that in 217 years as the Capital of the United States-and 33 years after the passage of NEPA-the first significant Federal NEPA undertaking in the modern era has just been approved by the FHWA in DC. 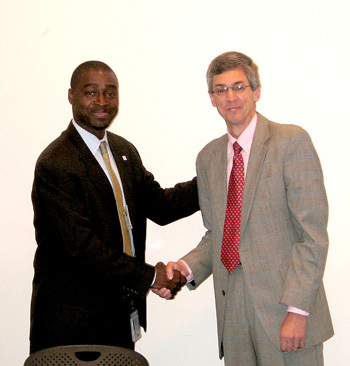 Emeka Moneme, DDOT Director (left) and DC Division Administrator Mark Kehrli signed the first Record of Decision (ROD) ever written for a Federal undertaking in Washington, DC. 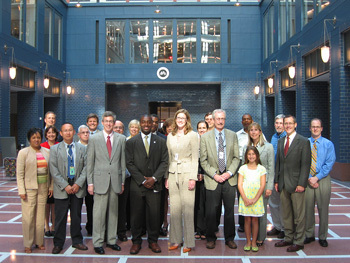 A signing ceremony took place at the FHWA Headquarters to mark this momentous occasion. Mark Kerhli, Division Administrator for the District of Columbia Office, said "We stand here at a pivotal moment in the transformation of an important sector of the city, and I take great pride that a transportation project is leading the way. The first Record of Decision in the District of Columbia . . . this is quite a moment. FHWA along with our transportation partner DDOT are a major part in the realization of a new vision that will result not only in the continued revitalization of the Anacostia riverfront, but will also serve to compliment the legacy of a plan that was envisioned over 200 years ago." Emeka Moneme and Mark Kehrli shaking hands after the historic signing. DDOT Director Emeka Moneme added, "This is a significant step for DDOT and I want to thank FHWA and my staff for all the hard work it took to get us to this important milestone today. This is a proud moment to be standing here as the Director of a great organization like DDOT." 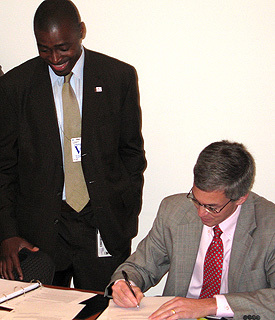 In a gesture reflective of the relationship between the FHWA DC Division and DDOT, both Mark Kehrli and Emeka Moneme signed the ROD. In an effort of this scope and magnitude, no single individual can take credit for its accomplishment. There are many fingerprints on the NEPA document that culminated with the ROD. In a group photo taken at FHWA Headquarters after the signing ceremony, some of the individuals that played a key role in the development of the NEPA documentation for the 11th Street Bridges project are pictured. DC Division; Carol Kissal , DDOT with her daughter Chloe; Owen Lindauer, FHWA Headquarters; Bryan Nicol, CH2M Hill; and Michael Culp, FHWA Headquarters. Not shown: Sharon Vaughn-Fair, Eastern Legal Services, FHWA; Lavinia Thomas, Eastern Legal Services, FHWA; and Michael Saunders, FHWA Headquarters.